Toshiba Glass, the Japanese company’s Google Glass rival, has been spotted at CEATEC 2014 and will, according to reports, go on sale next year. Unlike the Big G’s clever specs, Toshiba Glass has no battery, no processing power and is also devoid of wireless functionality – it’s essentially a projector side loaded onto a pair of specs that requires smartphone tethering at all times. That means running a wire from your frames down to your pocket, but it should also mean that Toshiba Glass comes in much cheaper than Google’s effort. Toshiba Glass takes the projection and displays it to the user through prism-packing lenses; there’s no separate prism as per Google Glass. It’s said to be coming to Japan and North America in a range of frames (standard, sport and industrial) in 2015. Google Glass is, without doubt, the poster boy of the smartglasses industry, but there are plenty of alternatives coming to market. While the more popular genres of the wearable technology market – i.e. smartwatches and fitness trackers – enable us to simply do the things our smartphones do from the wrist, smartglasses tantalise with promises of life-changing benefits. 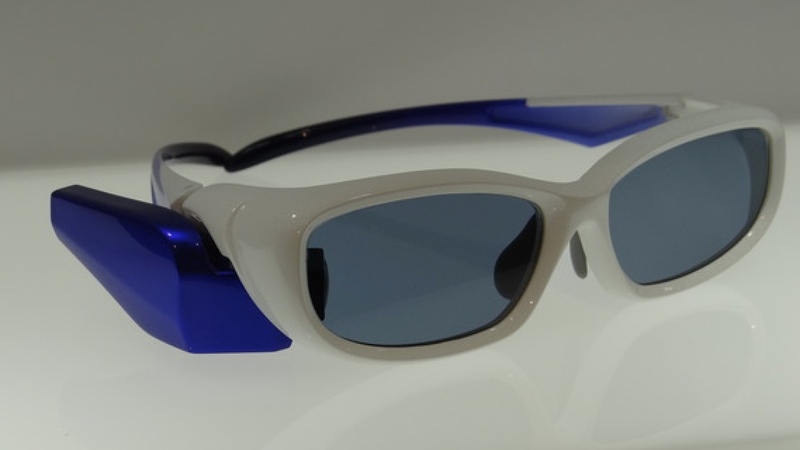 Toshiba is just the latest company to show off its hi-tech glasses. Sony recently released the tools to let developers start coding applications for its SmartEyeGlass and there’s a number of fascinating devices in the works. Take a look at our feature on the best smartglasses to find out more.